Instagram has launched yet another attack on Snapchat. Well, kind of - it's more a refinement of a previously existing functionality, but it may cause an impact nonetheless. 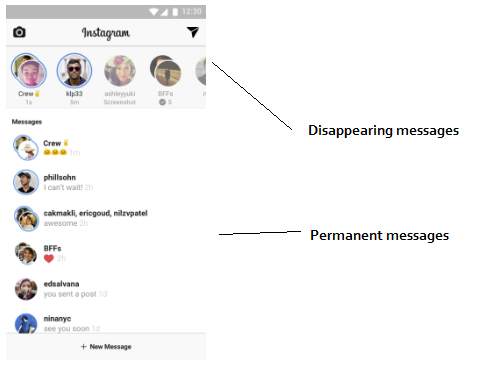 Last November, Instagram launched disappearing messages in their app, with a new, separated inbox which included ephemeral and permanent messages in one feed. The Snapchat-like addition to the process has been well-received, and now, Instagram has decided to combine the two, with ephemeral and permanent messages appearing in a single response thread. As you can see, gone are the Stories-like profile bubbles at the top of the screen, signifying disappearing content. Now, the difference between the two message formats will be defined by color (which you can see in the right-hand side image) - black for regular messaging that will remain for as long as you choose to keep it, and blue for disappearing messages, which you can replay once after initial viewing, then it's gone. Why the change? According to TechCrunch, Instagram's data showed that 85% of people's Direct messages go to the same three friends, as opposed to being a broad-ranging communications tool. Which makes sense - the focus of the Direct option is on more intimate, goofy sharing - but that also means that incorporating them into the main messaging flow won't cause mass-confusion, as there's only a small group of your friends who you'll also have a Direct messaging connection with. By moving them into a single, amalgamated thread, it gives users more options on ways to connect and communicate, and enables them to keep track of the various types of messages without having to switch back and forth between the messaging options. As noted, the basic rule of the new inbox to keep in mind is black equals regular message, blue equals ephemeral - you can see how this is divided in the messaging interface. Given the overall growth of direct messaging, it makes sense for Instagram to make it more of a priority - even on their own platform, they've seen a significant jump in the amount of people sending messages. Connecting their advanced camera tools into their messaging features makes sense for Instagram's focus - and yes, it does also bring the app more in-line with Snapchat's functionality (as noted by TechCrunch, the only thing you now can't do through Instagram Direct that you can on Snapchat is send disappearing text messages, though you can create a caption in a Direct image). The parity between the two apps, will likely work in Instagram's favour - why go to Snapchat if you can reach more of your friends on Insta? But then again, the real test is probably less about the same features and more about what else is available - what can Instagram provide that Snapchat can't? At this stage, the features in both apps are very similar, almost identical. What they come out with next could be the real impetus, could make their target audience really consider which is the best home for their everyday interactions. Better Lenses? New, interactive filters? An advance on the Stories form? If Instagram can take a step beyond Snapchat's groundwork, that could spell significant trouble for the recently-listed camera app. 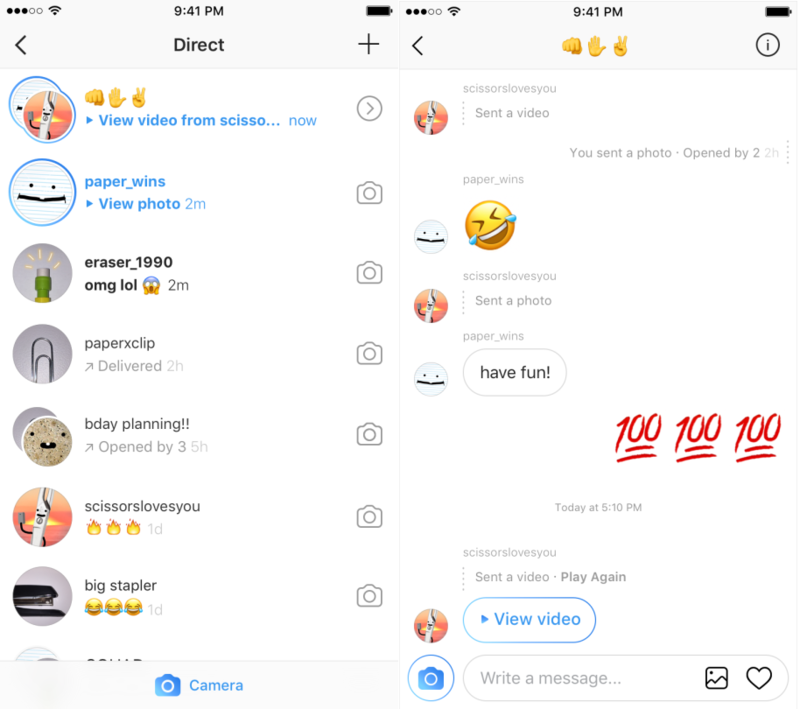 The new version of Direct is available for iOS and Android in the Apple App Store and Google Play as part of Instagram version 10.16.